Time for a little confession - Uncle John's Fully Loaded 25th Anniversary Edition isn't my first Bathroom Reader, and most likely not my last one either. So you could say that I'm a little prejudiced as I've always enjoyed these books. Of course for this particular edition I certainly expected the Uncle John's team to, once again, outdo themselves. The Bathroom Reader's are a series of books filled with trivia and short essays on various topics, some volumes dedicated to a single topic, while others, like this one, offer a broad spectrum from Law & Order to Stage & Screen and from Word & Phrase to Myths & Legends. In a nutshell? A light and entertaining read filled to the lid (pun fully intended) with genius conversation starters and useless but laughter-inducing fun facts. 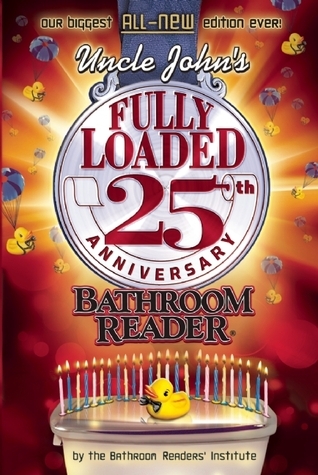 Due to the nature of the Bathroom Reader's, and the book title is already a dead giveaway, this tome makes for perfect reading material in the bathroom. Obviously you may just as well read these books on the couch or on the bus, but that is entirely up to you. Ultimately it is perfect to dig into anytime you've got a few minutes to spare! Honestly, after 25 years you can't help but wonder how and where they dig out so many new topics without getting repetitive, but once again Uncle John doesn't disappoint! In short: Fully loaded indeed! Will keep you from being bored during many sittings to come!